As the year begins, I of course have my most anticipated cinematic releases, once again all noted in my original list you can find here. Now, after seeing It just last week, I have my opinions on all five films - and so here's my ranking of them not in terms of hype but now overall quality. The Pirates of the Caribbean franchise has always been commercially successful but never the most critically acclaimed; this year's Dead Men Tell No Tales certainly doesn't find itself in any better circumstances, in fact in even worse ones considering it's even weaker box office earnings. I've always been a big fan of the series, perhaps On Stranger Tides less so, but it's this installment that certainly deters my interest for any future sequels and makes it very evident that there's just no real creative potential to keep going. The key issue is just the story itself. Not only is it weak when you view it altogether, but it's so badly developed that even over an hour into the film it's hard to fully piece together what exactly is going on and why. Javier Bardem performs well as villain Salazar, but the character is so poorly structured that he holds little interest outside of a cool design and Bardem's solid acting. Indeed, outside of the impressive visual effects and occasional charms of Johnny Depp (who clearly isn't interested anymore), Pirates of the Caribbean: Dead Men Tell No Tales is simply just as bloated and awkwardly structured as it's title. I've made it quite apparent by now that I hated Tom Holland as Spidey in last year's Captain America: Civil War. Hell, the entire film I found fairly average considering it's glowing reviews, but it was both Spidey's forced integration and bloody irritating persona that made my appreciation for the film dwindle even lower as the climax approached. It wasn't so much Holland's acting as it was the weak development and writing the character fell victim to - not a good starting point for a very big moment in the series. But that didn't detract from my interest in the character's first sole entry in the franchise, and whilst the finished product is far from the best the MCU has to offer, it's a pleasing step forward from the iffy Amazing series with some superb visuals, a strong cast, and an entertaining if somewhat underdeveloped villain. It's also satisfying to see Tony Stark have a genuine significance in the overall narrative - trailers and posters of course made it seem like he was a forced integration of the MCU's biggest icon in order to generate more hype, but thankfully this is not the case. The overall story flows nicely and is backed by some gripping set pieces, making Homecoming the debut Spidey really deserves in this monster of a franchise. With earnings of over $500 million in the US and $1.2 billion globally, Beauty and the Beast ranks as the highest grossing film of the year - such an accolade doesn't go undeserved, even if the film isn't without fault. Disney look set to revisit more and more of their classic animated hits in live action as time goes on, and Beauty and the Beast is largely a decent example of how this can be done right when you're working with some of the most treasured material of all time. The film's overall visual design is a superb live action reimagining of the original's vivid animation, and a strong cast help bring it to life even further - perhaps my only grudge with said cast is Emma Watson who, despite visible effort, doesn't really capture the role of Belle...a problem that evolves into something even uglier when you hear that dreadful electronic singing voice of hers. In fact, whilst many of the songs are nice modern updates of the originals, most of them lack the majesty and charm, feeling too often like actors who really can't sing awkwardly forcing themselves to do so - a sort of Mamma Mia scenario, if not quite that bad. One actor not doing an amazing job isn't the end of the world, but of course is a little more serious if it's the lead protagonist. Still, Watson has her moments, and is far from terrible - just miscast if I give my honest opinion. It's the supporting cast of Ewan McGregor, Ian McKellen, Emma Thomas, and Luke Evans to name a few that adopt their roles perfectly, and of course the same can be said for Dan Stevens as the Beast himself. The effects used to animated many of the side characters, who also have new designs that feel fresh yet loyal to the originals, are just as superb, and thus the finished product is one that can never live up to the original but still an entertaining and heartfelt experience. Based on Stephen King's acclaimed horror novel, It ranked as my most anticipated film for the entire year - and it sure didn't disappoint. Already the film has won over countless audiences, achieving a record breaking opening weekend for the entire horror genre and rivalling some of the biggest superhero blockbusters in terms of it's ongoing domestic earnings. Arguably the most impressive aspect of the film at first glance is of course one Bill Skarsgard in the role of Pennywise the Dancing Clown; his performance is beastly and extremely frightening in many scenes and this, coupled with an impressive and stylishly dark production design, equates to an absorbing and chilling experience. But his acting isn't the only merit. The protagonists of several young teens dubbed The Loser's Club perform admirably considering their age - something never easy to master for such young characters with extremely complex development. This, alongside a very engaging story, all helps render It a benchmark in modern horror that proves also how important it is to entertain the audience outside of just decent scares. It's a shame to see the latest entry to the rebooted Planet of the Apes series struggling to achieve the success of it's predecessors. With only $370 million in worldwide earnings, as opposed to $710 million from it's predecessor three years ago, the epic nature and element of finality to the narrative clearly wasn't enough to win over similarly large audiences. 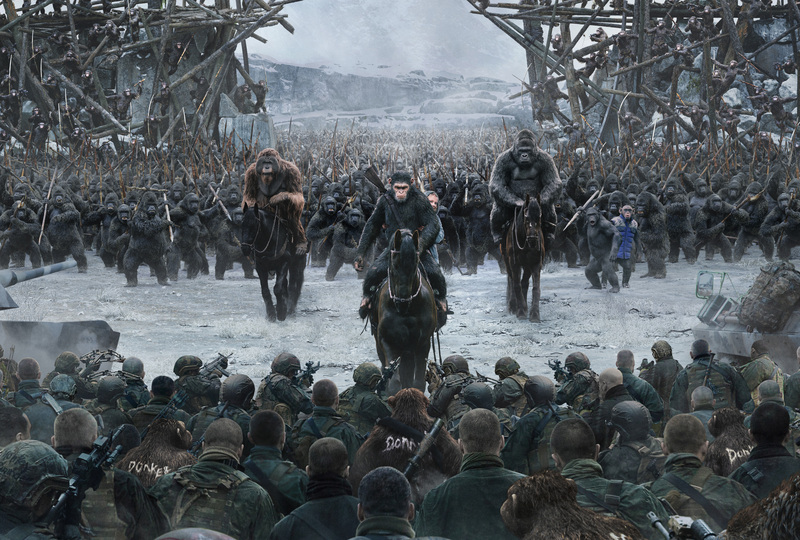 On the critical side, however, War for the Planet of the Apes has not failed one bit, and it's thoroughly deserving of all the praise it has earned - I could now easily class this one of my favourite trilogies in film history. War builds upon the high stakes that the ending of Dawn generated, with the apes now battling the humans to determine Earth's dominant species now that all chances for peace are lost. However, whilst there's plenty of action and visual thrills, this is also a film with an intelligent, thoughtful story - so much so that long periods without action never become boring, in fact just as interesting when we see the story advance with all sorts of twists and turns. Andy Serkis also helms a fantastic cast with another masterful motion capture performance as Caesar, who again has the same engaging characterization as before - if you've yet to see this film, or in fact either of it's predecessors, that is a fault you must rectify as soon as possible.